Don’t believe everything you read. People have been offering that advice for centuries—because it’s true. Take for example the recent study claiming that flossing is ineffective. At Complete Dental Care, Drs. Kostas and Cardarelli see the effects of not flossing in patients who have chronic tooth decay and gum disease. Therefore, your dentist in Burlington is sticking by the American Dental Association’s recommendation to floss at least once a day. When you floss you get rid of bits of food that may be stuck between your teeth. And we’re not only talking about particles you can see, but also those that are so small they are virtually invisible to the naked eye. Bacteria feed on these and excrete acids that cause cavities. Plaque is a colorless biofilm that accumulates in our mouths every day. Flossing covers approximately 40 percent of a tooth’s surface. 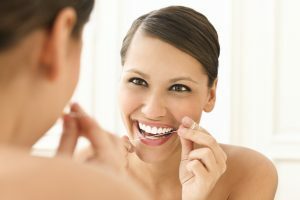 Flossing is the best way to make sure you’ve cleaned each tooth completely and have removed the plaque that can cause cavities and gum disease. For more tips on how you can improve your at-home oral hygiene routine, or to schedule a dental cleaning and exam, call Complete Dental Care in Burlington, MA.